Wow, so much to do, so little time. Once again, this poor blog is suffering and all my good intentions of keeping it up todate go out of the window. Bad news for a web designer! but, of course clients always come first. Despite the pressure I am glad to say we've made some time for Giacomo who came to us for work experience. Together we've designed and built a small site for his parent's hair dressing salon in Kirk Michael. Giacomo has talent and if he would take it up later would have a definate future as web designer with his flair for coding and design. 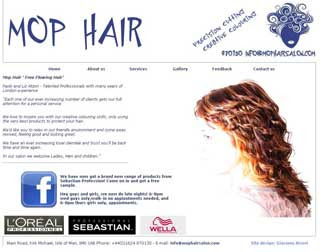 See for yourself www.MopHairSalon.com. 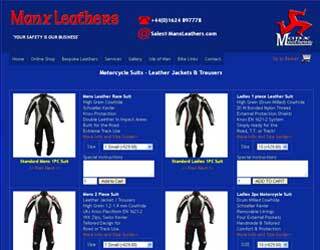 Brilliant for cutting and colouring, by the way ..
We've also put live the shopping site for www.ManxLeathers.com with high quality leather race suits and other clothing items for motorcyclists. I am sure it will do well with more items coming soon. We just love his hand-made leather badges. Take a peep and tell all your biking friends. Well done and Good Luck to Steve!! Meanwhile w are building a complex site for a star dermatologist and this is taking much longer than anticipated ... More news on this very soon - it's gotto go up in the next few days - or weeks if things are being changed - but have high hopes to let you see it asap (if its up to us). Now, some very important news: We have a yet another office helper - a highly intelligent programmer - with paws insteads of fingers. 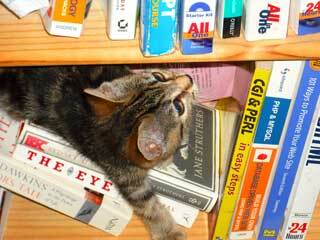 Even so, she is determined to read up on all the website books asap and raiding our book shelf. Not joking, Here is Trxiebel 12 weeks and counting. See for your self. If you also want a job or maybe some work done with her help then contact me asap!